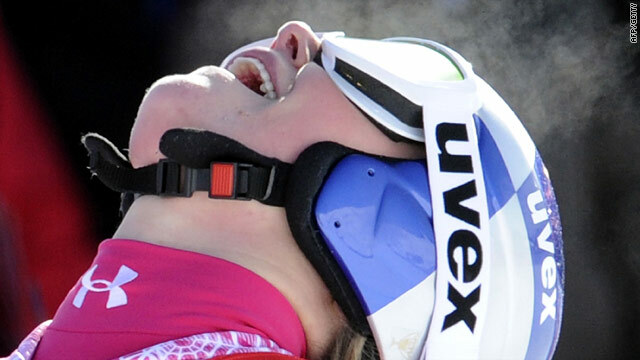 An elated Vonn celebrates her latest victory in super-G in Switzerland. (CNN) -- Lindsey Vonn wrapped up the World Cup super-G crown by claiming victory at St.Moritz on Sunday for her third straight win in the speed discipline. Vonn will head for the Vancouver Winter Olympics as warm favorite for the super-G and other speed events, but is still nursing a painful hand she sustained in a crash last month. But after a rare failure in the downhill at the Swiss resort on Saturday, Vonn was back to her peerless best on the Corviglia piste. The United States star finished in one minute 01.77 seconds, 0.17secs ahead of Andrea Fischbacher of Austria and Marie-Marchand Arvier of France, who shared second place. The win extends Vonn's overall World Cup lead ahead of Germany's Maria Riesch, who had cut the gap 24 hours previously by winning the downhill. But Reisch could only manage 11th place in super-G and Vonn stretched her advantage to 137 points over her great friend. Vonn opened an unassailable lead in the super-G race over Fabienne Suter of Switzerland with only two races to come after the Olympics. There was nasty setback for Italy's Olympic hope Nadia Fanchini, who looked to have injured her knee in a fall. In men's World Cup action on Sunday Reinfried Herbst led an Austrian 1-2 finish in a slalom at Kranjska Gora in Slovenia. Herbst finished two run on the Podkoren 3 course in one minute 45.35 seconds to beat Marcel Hirscher by 0.40 seconds. It was Herbst's second victory of the week after winning onTuesday at Schladming in Austria, and his fourth of the season. Julien Lizeroux of France claimed the final podium position with Ted Ligety of the United States, who won Friday's giant slalom, initially fourth but later disqualified. Benjamin Raich of Austria claimed seventh to extend his lead in the overall standings to 106 points over Carlo Janka, who sat out the event.